I am so proud of this little milestone marker for the podcast! 25 episodes of continuous bi-weekly (plus bonus mini-sodes) podcast episodes. Yay!!! As I have mentioned in previous episodes, it took me a full 4 years to get this podcast published. I purchased my podcast microphone in 2014! I did a couple of tiny practice audio clips, but lost my nerve and decided that I needed to research extensively and learn more on podcasting so that I could start the podcast with THE PERFECT episode. Fast forward to January 2018 - I made a New Year’s goal to publish my podcast - no more excuses. I started recording episodes in March - and in that timeframe, I recorded 4 episodes, learned the editing software, got a hosting service, updated my website with this podcast blog page, and on July 17, 2018, my very first episode went live!!! This is a dream come true for me, and I love podcasting! It is a huge amount of work for a one person operation like me, but at the same time it is so much fun for me to get to know other creatives that love to do the same thing I do with sewing, quilting, decorating and making. Being a part of this maker community is so fulfilling and an absolute necessity for me. It feeds my soul and makes me so happy to be a part of it. Thank you so much for listening to my podcast, and for emailing me, commenting on the show notes, posting itunes reviews, and letting me know that you enjoy the show. Hearing from listeners makes my day, if not my whole week! It motivates me to keep bringing awesome content and guests to share with everyone. My try at FMQ - haha! I knew Christa Watson was a quilting superstar, but it wasn’t until I was able to have a face to face (via video call) conversation on this podcast episode, did I learn that Christa was also one of the most amazing people I have had the pleasure of speaking with. I do not say this lightly, because I really felt that Christa was fully present and engaged in our conversation. In addition, we learn about the two books that Christa authored and one she co-authored with Angela Watson on Machine Quilting. Christa is a great teacher and presents machine quilting with a straightforward approach building skills with practice and repetition. We also chat about interior decorating and Christa’s recent move into her new home and how she shared her decorating progress including a paint color redo. Christa was able to design her dream sewing studio from scratch, and had gorgeous ikea built-in cabinets installed, center sewing table with her shiny and trusty Bernina sewing machine, as well as her recent DIY quilt design wall she and her husband installed together. I hope you enjoy listening to Christa Watson’s story on this episode, and if you want to give machine quilting a try, check out her website, purchase her books and she also has online classes on Craftsy/Bluprint on quilting from beginning to end. I use these add a quarter rulers and printable freezer paper to print foundation paper piecing patterns and fold the seam lines back with the tapered edge ruler. 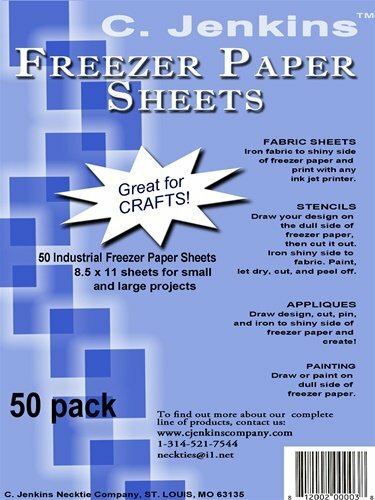 C. Jenkins 50 Industrial Freezer Paper Sheets 8.5" x 11"